In today’s talk, pundit Sally Kohn shares what it’s like to be progressive, Sally Kohn: Let’s try emotional correctness gay and … working for Fox News. The key: emotional correctness, when people look past their political differences and try to understand what the other is thinking on a human level. It’s a vision so powerful that her hometown of Allentown, Pennsylvania, has declared today — December 4 — Sally Kohn Appreciation Day. Since speaking at TED@NYC in October, Kohn has parted ways with Fox. The TED Blog reached out to Kohn to hear the latest developments, and to ask how her thinking has changed now that she has some space from Fox. Below, an edited transcript of the conversation. First off — happy Sally Kohn Day! How will you be celebrating? I’m going to have a TED Talk posted! And then maybe eat a hoagie. Where did the decision to leave Fox come from? Fox News and I parted ways amicably and I’m looking forward to exploring new options. To correct a slight misnomer — and a popular one, based on the phrasing of The New York Times story — I am not with MSNBC now, I’m simply a free agent. Exploring my options. Feeling the wind in my hair. What are you looking to do in the next months or years coming? I feel very fortunate to be able to have an opinion. In the world right now, certainly in America, some people don’t even have the luxury of feeding their families or a place to live, let alone have an opinion that people listen to. So it’s a pretty privileged and powerful position to be in. For me, that’s always meant writing. I’ve been writing regularly for Salon and CNN, and I’ve been writing a weekly column for the Daily Beast. I’ve been continuing to go on television — on CNN, MSNBC and Fox. But there are lots of ways of changing the world, and I don’t want to just have opinions — I want to be able to give my voice to really make a difference in the world and to make sure that others can be heard too. I’m not sure what form that takes, but that’s where I’m going. Is it easier or harder to be emotionally correct at MSNBC, or another media outlet that has political beliefs closer to your own? It’s easy to think that emotional correctness is some utilitarian trick to use only in some environments, but really it applies everywhere. When I’m on MSNBC, I want to be modeling the tone that I think all liberals should take — call it sharp-elbowed civility or disagreeing without being disagreeable. Everything that’s embodied by “emotional correctness.” We all need to do it more, myself included. So whether I’m talking about Obamacare to an audience that loves it or hates it, I’m still practicing my own emotional correctness — and hoping everyone picks it up, on both sides of the aisle. Has your thinking about emotional correctness evolved or changed since leaving Fox? There’s a school of thought that says if we were all kind to each other — if we all embrace this notion of emotional correctness — then we’d be glossing over our profound political differences. I don’t see it that way. I really don’t. I think we can have incredibly tough political differences and yet still be decent towards each other. I think this is the best practice for our democracy, and we can actually get somewhere with that. The jury is out on whether it’s the left or the right — or some new political formation — that masters this first. Whatever side grasps this first will win, because we’re all just preaching to our own choirs right now. Unless we find ways to expand those choirs, it’s just sort of intractable. In your talk, you mention a moment at Thanksgiving where you butted heads with your uncle on political views. What have you learned from that experience? I really think Thanksgiving and the holidays in general are a great time to remember the essence of emotional correctness. I might not agree with my uncle on everything, but I’m actually willing to listen and find that there is a lot we agree on. That can get lost if we’re just bumping heads on major things. During the holidays, you remember, ‘Hey, I love this guy,’ even if we disagree on the Iraq war, or tax policy, or if we vote for different parties. The things that he worries about when he goes to sleep at night and hopes for when he wakes up in the morning are the same things I think about. And he wants me to be safe and happy and I want him to be safe and happy. If you can take that and remember that microcosm and express it, it’s not that different with everyone else. We just don’t get to sit across the table with a turkey with everyone in the world. It’s somehow keeping a little of that in your head before you press send on that tweet or email. It allows us to hear each other more, which I think is the way to get to real dialogue. I am a strong progressive. I believe very strongly in a lot of things and mission in life is to try to persuade people of the values that I believe in. But I don’t want to just be yelling into an empty room, talking to people with glazed-over eyes. So if we can remember that and meet people where they’re at — and start with a connection — I think that’s the key to being heard and being persuasive. 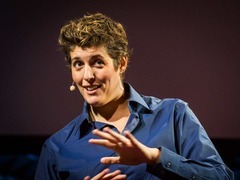 Pingback: TED Talk: On Emotional Correctness - Sally Kohn — columnist. activist. pundit. etc.